Scotland’s Jane Turner claimed a four-shot victory in South Africa, backing up two rounds of 69 by going one better in her final round at the SuperSport Ladies Challenge in South Africa. 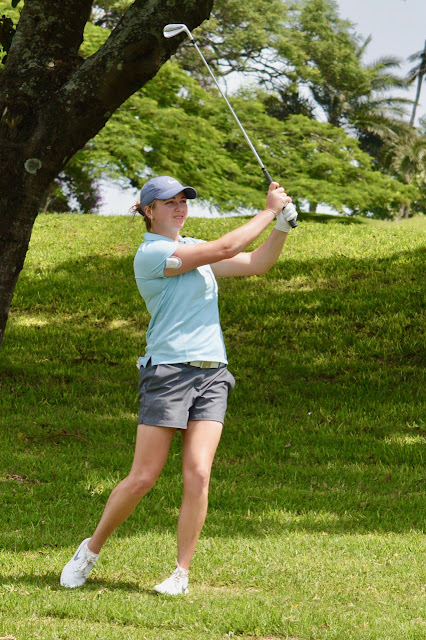 The Dalmahoy Hotel and Country Club player was the only competitor to finish the week under par as she went on to claim her first Sunshine Ladies Tour victory at the Wild Coast Sun Country Club. It was also a promising week for fellow Scots Gabrielle MacDonald (3rd) and Hannah McCook (T5) with both rookies finishing in the top five. Turner’s win marks an excellent month for Scottish golfers in the Rainbow Nation with Euan Walker winning the African Amateur just two weeks ago. Aboyne's Shannon McWilliam, pictured, improved on her first round by 10 strokes with a brilliant, seven-birdie round of 65 to be the only Scottish qualifier for the match-play stages of the Spanish women's international amateur golf championship at Zaudin Golf Club, Seville. Curtis Cup international. McWilliam, whose only bogey came at the ninth, birdied the fourth, fifth, seventh, eighth, 12th, 14th and 16th in halves of 33 and 32 to advance in joint ninth place with an aggregate of 140 of the 32 match-play qualifiers. Lesley Wood has collated information from several east Lothian websites and this can be found on one of their webpages -- CLICK HERE. 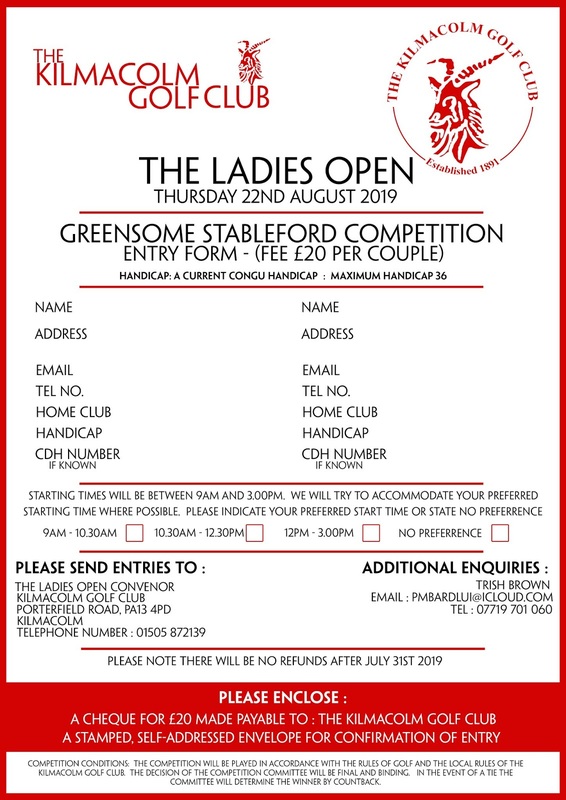 Opens are a great way of playing a variety of clubs in the area, they can be booked online, though the club website or by a printed entry form depending on the club. There are also several sites that can be accessed to help you enter many different open days (around the country) as you will see from their website. 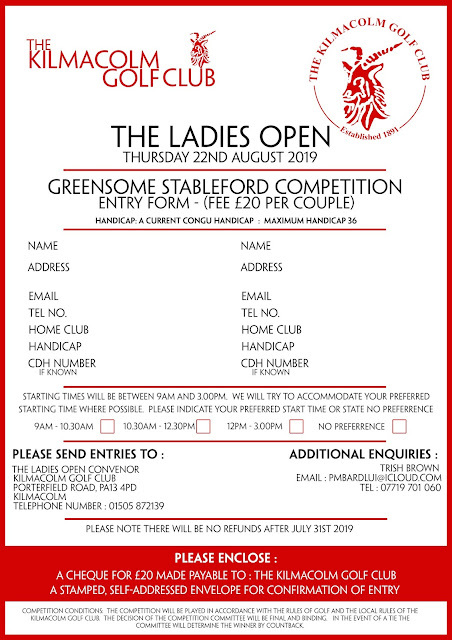 Printed forms can usually also be found at the individual club websites. Scot Jane Turner fired a second successive 69 to forge a two-shot lead on two-under at the summit of the leaderboard at the Wild Coast Country Club on Wednesday in the second round of the SuperSport Ladies Challenge presented by Sun International. The Dalmahoy Hotel and Country Club player carded six birdies, including three in row from the 15th, to open a gap between herself and Nobuhle Dlamini. The defending champion Nobuhle Dlamini is on level par following rounds of 68 and 72, three shots ahead of Chloe Williams from Wales, who returned rounds of 69 and 72. The annual D&A lunch was held at Douglas Park Golf Club on Sunday 24th February. 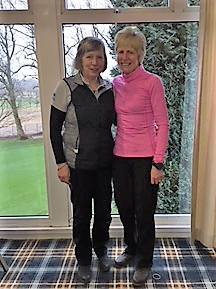 On one of the best winter days possible, at Drumpellier GC on Sunday 24th February Susan Halley and Anne Cameron, Strathaven, beat Irene Morton and Lynne Williamson, Kirkhill, 5&4 to win the Lanarkshire County Winter Foursomes Final. 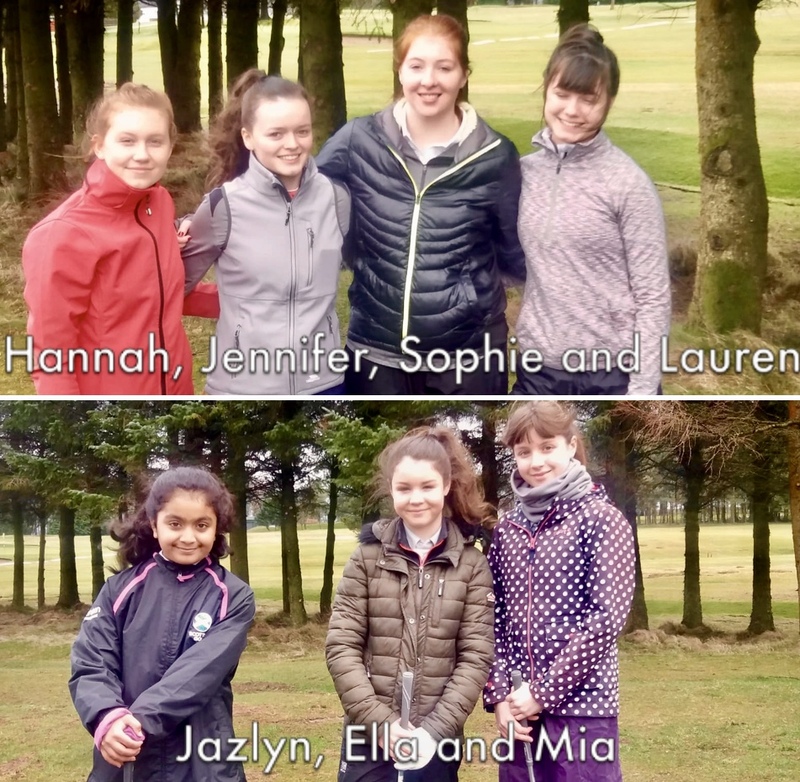 The West Girls Team of Hannah Carson, Jodie Graham, Katie Graham, Katy Hill, Sophie Kyle, Kittie Maslanka, Samantha McKay, Claire McLaughlin, Orla Rooney, Freya Russell, played a friendly match against Dunbartonshire Boys at Balmore Golf Club on Sunday. Might not have been the victory the team would have wanted , but a great day to be playing golf in February ☀️. Last week aspiring PING Junior Solheim Cup player, Hannah Darling (Broomieknowe) , had the experience of having Catriona Matthew caddie for her. A member of 'Project 19', Hannah and her fellow members will be targeting a berth at this year's event. Georgia Hall, the Women’s British Open champion, is to play a leading role in helping to get more women and girls into golf after becoming an official ambassador for the R&A. The 22-year-old has been signed up by the governing body on the back of the Women in Golf Charter, which was launched last year. “There is no better-known body in golf than the R&A, so I was extremely honoured to have been invited to be an ambassador for the organisation,” said Hall. 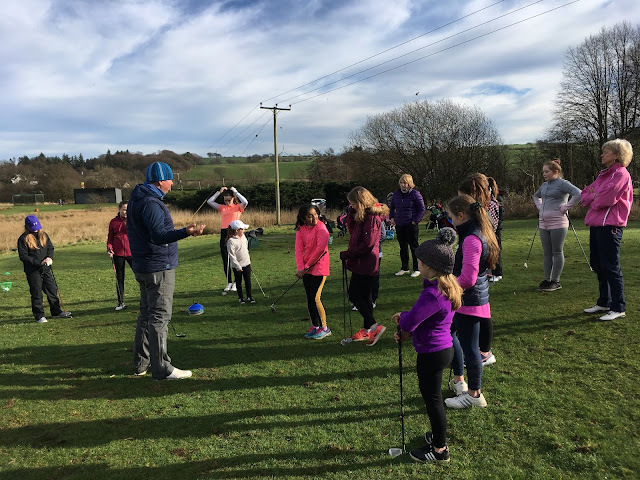 “I am passionate about helping to grow the game, so it’s very natural for me to support the R&A’s great initiatives, particularly for women and children, over the coming years. By making her major breakthrough at Royal Lytham & St Annes last year, Hall became the first golfer in the history of the sport to win the Women’s British Open, the Women’s Amateur Championship and the Girls’ Amateur Championship. “Georgia is an influential role model for our sport and we are honoured that she has agreed to become an ambassador for the R&A and work with us to promote our activities in women’s and girls’ golf,” said chief executive Martin Slumbers. “She has shown that talent, hard work and determination can take you to the very pinnacle of our sport and she deserves enormous credit for her victory in the 2018 Women’s British Open. Douglas Park Ladies held their opening social event of the year arranged by the new Captain Denise Macnaughton. 95 ladies attended this Night of Nashville theme with everyone having great fun - as you will see from the video below. Click here to see some photos and also alternatively HERE ON FACEBOOK - Thanks go to Ann Fisher for the additional photos at the end. From Denise -- Lady Captain. 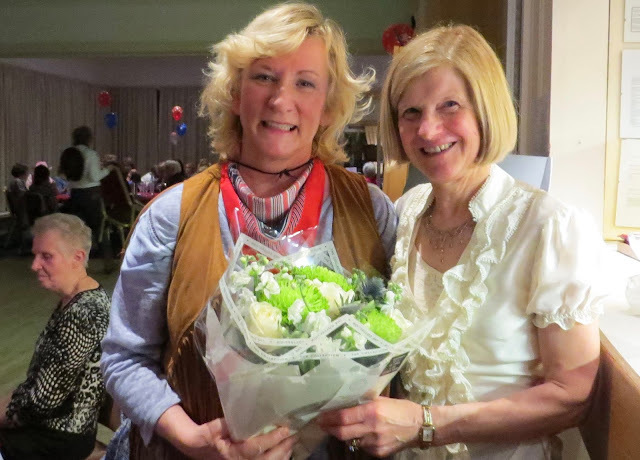 My thanks go all the ladies who took part in the 'Night at Nashville" evening on Friday night. Ninety five ladies arrived, dressed up as cowgirls, and it was a delight to see how the ladies at Douglas Park threw themselves into the spirit of the evening. The night began with a reception and welcome cocktail – “The Dolly Parton” - provided by our own ‘Queen of Cocktails’, Olive MacKay. It was a fabulous way to start the evening. We had our own Dolly Parton in attendance AKA, Moni Ainslie, sporting not just a dolly wig, but false eye lashes to complete the look. This was followed by a delicious meal, provided by Lisa and her team, and needless to say, everyone said it was superb. After dinner we got down to business with the hoedown. Patricia & Baden Brown provided the entertainment – some line dancing and a rendition of old favourite songs, while the ladies did their own version of line dancing on the dance floor. Thanks to all the wonderful Douglas Park ladies – a truly wonderful night to remember. 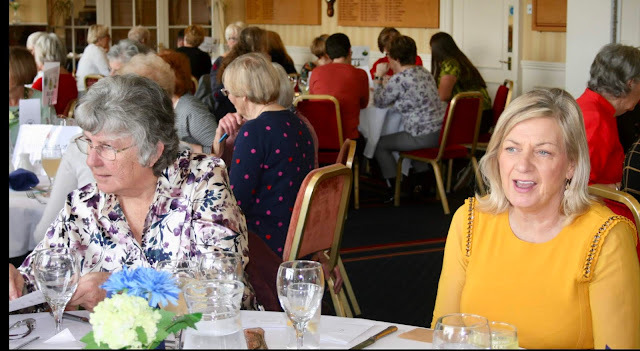 Apart from Gin tasting there was also a raffle, and a game of bingo to keep everyone entertained in their social evening while they waited for the star attraction “The Barassie Lassies and The Loudoun Lady” which was a 7 piece ukulele band. Today saw our third organised winter meet up with a lovely dry calm afternoon at Caldwell Golf Club, arranged by Caldwell and RLCGA member Liz Hale, supported by Lynda Bradley [Junior Convenor, Kilmacolm] and led by Club Professional Mark Loftus, grateful thanks to each of them. Marianne Skarpnord ended a six year drought to claim her fourth title on the Ladies European Tour after a closely fought battle for the Pacific Bay Resort Australian Ladies Classic – Bonville. 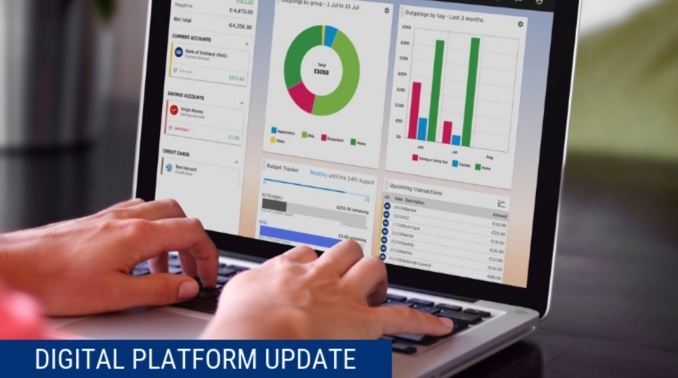 Following our last correspondence with you at the end of January, Scottish Golf is pleased to provide clubs with a further update on the new Venue Management System. Recruitment: With over 300 clubs expressing their interest in adopting the new system, Scottish Golf identified that there was a need to recruit two new Project Managers to support with the implementation of the VMS across Scotland. Ensuring that clubs receive adequate support is crucial, and in order to make the transition for clubs as smooth as possible, the new post-holders will have a specific focus on supporting clubs interested in adopting the system. We are pleased to confirm that recruitment has taken place for these roles, with both successful applicants bringing a wealth of experience to the organisation. Both post-holders have worked in golf, and more importantly, with golf clubs in Scotland and will be a huge asset to the organisation. Both post-holders are looking forward to working with our clubs and will be in touch with all clubs who have expressed an interest in the digital platform in the next 4-6 weeks. Since our last correspondence, we are delighted to inform clubs that the system is now up and running in two test clubs. While both clubs share the same goal of delivering golf to its members, the way in which this is achieved differs operationally. It is this difference that provides us with the perfect opportunity to ensure that the full range of features that the platform has to offer are adequately tested in different environments. Like with all new technology, it is essential that we take our time to complete a robust test of the system to iron out any potential issues, ensuring that we listen to clubs and make sure that the new system works effectively for the user. This is a hugely exciting step forward and we will continue to provide clubs with an update once testing has been complete. Rookie pro Hannah McCook opened with level-par 72 to sit one shot off lead in Sunshine Ladies Tour South African Women’s Masters at San Lameer. Calling all County, Area & Club officials... With the closing date for registration approaching (1st March), we’d like to invite you all to the ScottishGolf AGM. 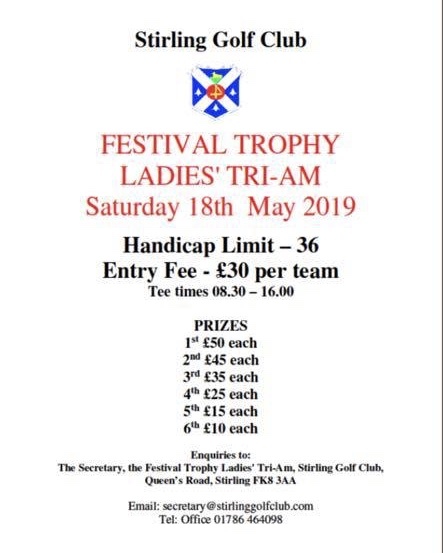 East Renfrewshire Ladies Open Day Tri Am is on Thursday June 13th 2019. KYLIE HENRY IS LEADING SCOT AFTER ROUND 1 IN AUSTRALIA CLASSIC. Gleneagles, the world-famous Perthshire hotel and sporting estate, has today announced Hannah McCook, as a new Golf Ambassador, supporting the iconic Perthshire venue’s plans to inspire more young people, school children and women to take up the game. Gleneagles will also host the 16th staging of The Solheim Cup, from September 9-15, the pinnacle of women’s professional golf, on the Jack Nicklaus-designed PGA Centenary Course. 2018 marked Hannah’s stand-out season as an amateur, winning both the Welsh Ladies Open Stroke-play and its Irish equivalent just a week later. 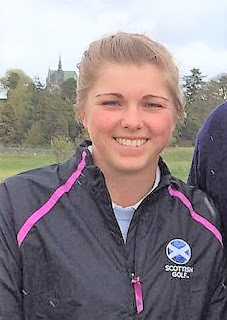 Hannah was part of the victorious team to represent Scotland at the Ladies Home Internationals in Ireland, and she also represented her country at the World Amateur Team Championships. The Semi Finals of the Renfrewshire County Ladies Winter Foursomes have now been played with the Ranfurly Castle pairing of Anne Judge and Marion Munro winning a close contest against Lynda Bradley and Clair Barclay (Kilmacolm). And her Karyn's final words were (from facebook )--- Been away working in Cyprus this week with Scottish Girls group...to say it has been eventful is an understatement....we have had sickness, lost wedding ring down van air vent so trip to....wait for it, RINGOS GARAGE and they were absolute stars 👌and retrieved it!! The 20-year-old Floridian was a bump in her mother Regina’s belly when her father Petr, a left-hander who won 10 titles, took the tennis Open in 1998, his only Grand Slam victory. She was a teen when her sister Jessica won the golf Open at Royal Melbourne in 2012 and just a year ago, her brother Sebastian won the boys’ title at the tennis Open. “There must be something in the air,” she said. It is not just a marketing spiel; it means something to the family. Nelly Korda said at the start of this week she felt “so left out” when her family talked about their Australian Open wins. Now, she can join in the conversation and on Sunday night, she even mimicked her father’s famous scissor-kick celebration. “That felt really good,” she said. Play for Day 2 of the event cancelled due to weather conditions. The Championship (Boys and Girls) will recommence tomorrow, Sunday, 17 February, with a 2-tee start at 07:45. The draw for the final day will be available from the event's webpage after 11:00 today. CGF greatly regrets to announce that, due to organizational constraints, today's Severis Cup (18-holes) and the 9-Hole competitions cannot be rescheduled and are therefore cancelled. Thanks go to Liz Keohone for the update. Jane Turner has been handed a boost for her 2019 Ladies European Tour campaign after the Midlothian pro secured a new base at Dalmahoy Hotel & Country Club, on the outskirts of Edinburgh. Dalmahoy has chosen the Ladies European Tour pro golfer as its ambassador, in a year when the women’s golf tournament – The Solheim Cup – returns to Scotland. As one of Scotland’s leading golf resorts, Dalmahoy was host to Scotland’s first ever Solheim Cup in 1992. Sam Oliver, director of golf and leisure at Dalmahoy continued: “With two 18-hole golf courses, designed to contrast and complement each other, a driving range and pitch and putt, we are proud to offer some of the best golfing facilities in the country. 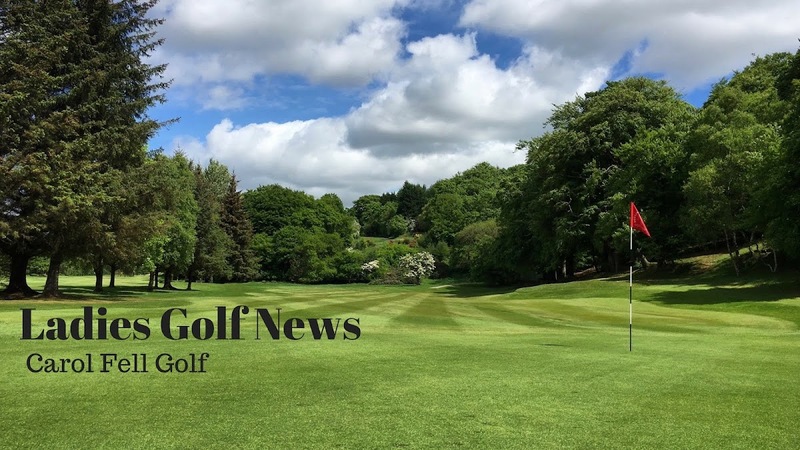 Dalmahoy’s golfing pedigree has attracted famous names such as Seve Ballesteros, Sam Torrance and Nick Faldo who have competed in various high profile professional events over the years including the Scottish Senior Open and the UK’s first ever Solheim Cup in 1992. A strong Scottish Girls team left today to fly out to Cyprus to join a strong international field in this year’s Nicos Severis Cyprus Junior Open which is being held from Friday 15th to Sunday 17th February at Minthis Golf Club near Paphos. Coach Karyn Dallas said "This is a warm weather training to wrap up winter work in prep for playing season starting April....see what they have taken on board and what we still need to work on....having a competition (WAGR points!!) is an added bonus"
Scottish Golf and The PGA join forces to host new Regional Junior Forums across the country. The R and A will stage the 2019 British Girls Amateur Championship at Panmure from Tuesday to Saturday, August 13 to 17 following an agreement reached with Montrose Links to move the event to an alternative venue. Duncan Weir, Executive Director – Golf Development and Amateur Events at The R and A, said, “We have a responsibility to all competitors to provide a world class experience in which they can perform to their full potential and this includes minimising any adverse impacts on the staging of the championship. “There is a risk that the concerts and their setting up would have caused disruption to the players so we have come to a mutual agreement with Montrose Links that the championship will now be played at an alternative venue. The British Girls Amateur Championship will celebrate its centenary year in 2019. 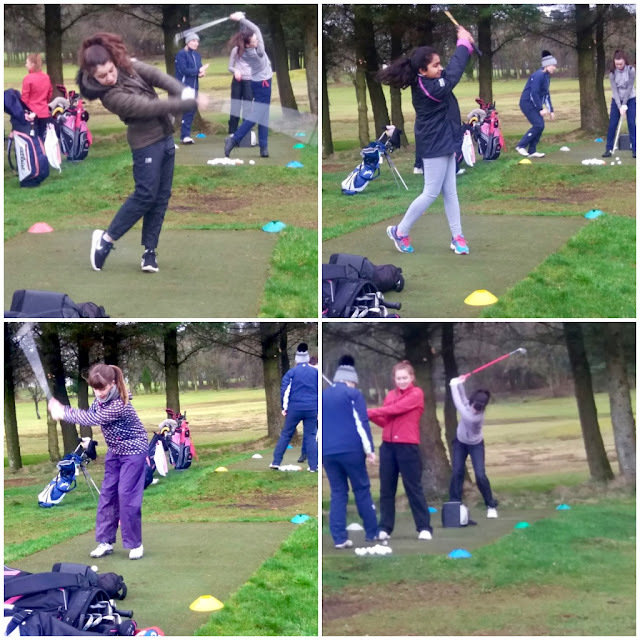 As part of #HandicapWeek, Scottish Golf visited Lucy Fraser at her home club of Murrayfield Golf Club to get her thoughts on becoming the 2018 Most Improved Female Golfer in Scotland. A member at Broomieknowe Golf Club in Midlothian,. The European team in the PING Junior Solheim Cup is captained by former Solheim Cup captain Mickey Walker and will see 12 of the best young female players in Europe take on their American counterparts. To be eligible, players must be aged 12-18 years old, having reached their 18thbirthday as of January 1st, 2019. The team will be comprised of six qualifiers from the PING Junior Solheim Cup rankings as well as a further six captain’s picks. The qualification journey will take place across 10 events in six more countries across Europe, before culminating at the Girls’ British Open Championship at Montrose Links, Scotland, from 13th-17thAugust.